Bump in a Box features everything the pregnant woman needs in maternity clothes. "Bump in a Box" makes a great baby shower gift. Women deserve to feel special when they are pregnant. 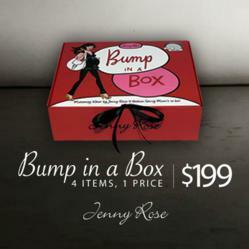 Dubai-based fashion designer, Jenny Rose is proud to announce her latest maternity collection, Bump in a Box. The Bump in a Box includes four clothing items, for one price, which all go together and can be mixed and matched. It’s the essential maternity collection for fashion savvy moms to be! It isn’t easy to look great and be comfortable at the same time when you are expecting; but with the Jenny Rose collection you’ll be the comfiest fashion forward mom in town! The collection includes Long Pants, Short Sleeve Tie Top, Long Sleeve Ruched Top, and a Long Skirt. Offered in black, all Fabrics are 69% Cotton Jersey, 17% Spandex and 14% Nylon. The pieces can be dressed up or down depending on the occasion. With clean lines and accentuating fabrics, the fold down pants and skirts will help pregnant women unleash their inner confidence and femininity, regardless of the occasion or budget. Founded in 1998, Jenny Rose was the first dedicated maternity and transition wear retailer in Dubai and continues to set the standard for quality and fashionable clothing for women. She hopes to reach even more people outside of Dubai through her website, which also offers “My Cozzie,” her designer Arabic swimwear line.